Hawaiian Historical Society Calendar, 2019. I forgot to mention when I posted the nupepa calendar for this year, that we shouldn’t forget to order the Hawaiian Historical Society Calendar. It is filled with historic happenings for practically each day of the month! And for every month there is a classic image to boot. For more information, click here. Reissue of copyright for J. W. H. Kauwahi’s “Kuhikuhi o Kanaka Hawaii,” 1868. Now, therefore, know all men by these presents, that I, L. Kamehameha, H. H. M.’s Minister of the Interior, in accordance with a resolution of the King in Privy Council, bearing date the 15th day of February, 1858, and by virtue of the authority in me vested by Section 1st of the general provisions of Article 4. Chapter 7, of the Act to organize the Executive Departments—laws 1845 and 1846—do hereby grant unto the said J. W. H. Kauwahi, his executors, administrators and assigns, the sole right and liberty of printing, reprinting, publishing and vending the said book of forms in the Hawaiian Islands, for the term of ten years from the 15th day of February, A. D. 1858. 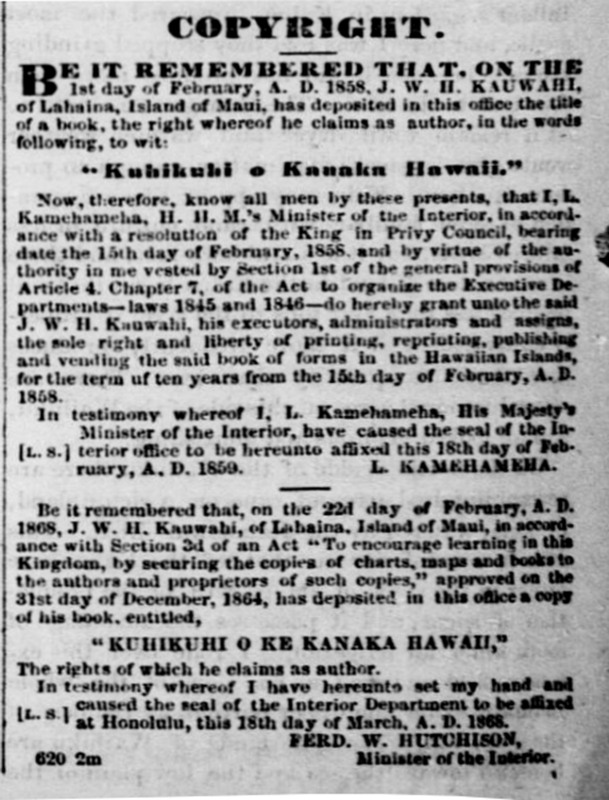 In testimony whereof I, L. Kamehameha, His Majesty’s Minister of the Interior, have caused the seal of the Interior office to be hereunto affixed this 18th day of February, A. D. 1859. L. KAMEHAMEHA. The rights of which he claims as author. In testimony whereof I have hereunto set my hand and caused the seal of the Interior Department to be affixed at Honolulu, this 18th day of March, A. D. 1868. The Pacific Commercial Advertiser, Volume XII, Number 40, Page 2. April 18, 1868. O ko’u aupuni, he aupuni palapala ko’u, 1837. From the Sandwich Island Gazette. 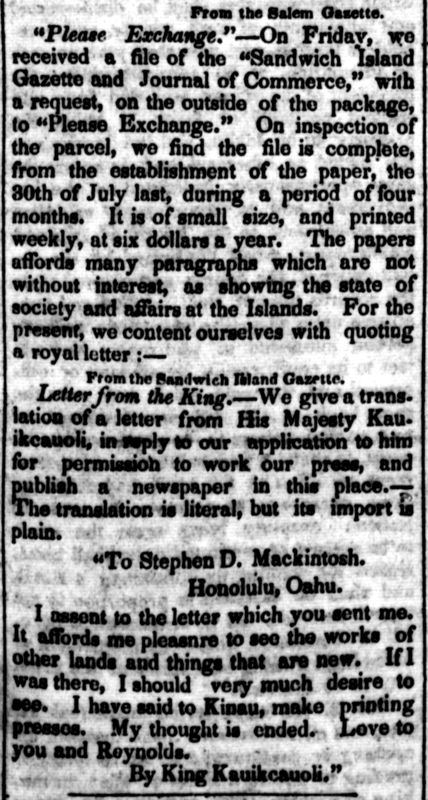 Letter from the King.—We give a translation of a letter from His Majesty Kauikeauoli [Kauikeaouli], in reply to our application to him for permission to work our press, and publish a newspaper in this place.—The translation is literal, but its import is plain. I assent to the letter which you sent me. It affords me pleasure to see the works of other lands and things that are new. If I was there, I should very much desire to see. I have said to Kinau, make printing presses. My thought is ended. Love to you and Reynolds. [This was a pretty exciting find. Kamehameha III proclaimed that his kingdom would be a kingdom of reading and writing. And indeed it was. Kamehameha III encourages the printing of newspapers, and here he writes, “If I was there…” because it seems he was in Kailua, Hawaii at the time, while the newspaper was to be printed in Honolulu. Unfortunately, The Sandwich Island Gazette and Journal of Commerce which ran from 7/30/1836 to 7/27/1839 is not available online at Chronicling America as of yet. Constantine Republican, Volume I, Number 48, page 2. May 31, 1837. Boat races celebrating the 49th birthday of King Kalakaua, 1885. 1—Yacht race [Heihei moku liilii]; Healani, Kahihilani, and Pokii, the one with the first name won. 2—Four-oared boat race, stationary seats [Heihei waapa eha hoe, noho’na kupaa]; Alvina, and Pualii, the first one won. 3—Canoe race. There were two canoes in this race, Mokauea and another, and the one with the first name won. 4—Whaleboat race [Heihei waapa hueloboti], Lanai and Homai; the one with the last name won. 5—Six-oared boat race of the senior crews of the Myrtle Boat Club and the Iolani Boat Club. Alice M. and Poomaikelani are the boats that raced, and the one with the last name won. 6—Swimming race, Mahuka, David, Kuia, and Koamahu, with the one with the last name winning. 7—Single scull race [Heihei waapa pukahi], but there was no race because of a lack of good conditions at the race grounds that day, being that the ocean was blustery [e ooloku ana]. 8—Six-oared boat race of the junior crews of the Myrtle Boat Club and Kaiulani Boat Club. Alice M and Kaiulani were the boats that competed with the one with the last name winning. This was the end of the races from the morning until 12 noon. 21 guns were sounded, and the scheduled races took an intermission. At this time, the boats of the Blacksmiths [Amara] and the Mechanics [Hana Lima Akamai] arrived at the grounds; Puaala and Malia were their boats with Puaala of the Blacksmiths winning. 9—Yacht race [Heihei moku liilii], Pokii, Mabel, Pauline, Lina and Commodore; with the one with the first name winning. 10—Racine canoe race [Heihei waapa], but they did not race. 11—Four-oared boats of the senior crews of Myrtle Boat Club and Iolani Boat Club; Alf Rogers and Poomaikelani, with the one with the first name winning. 12—Canoe sailing race [Heihei waa pe-a], Fleur de Lis, Mignon, Tippecanoe, and Pokui, with the one with the last name winning. 13—Diving Contest [Heihei luu], open to all, and Pelehu won with the time of 2 min. 54 seconds. 14—Whaleboat race with five oars; Lanai, Homai, and Kawaihae; Homai won. 15—Six-oared boats of the junior crews of the Myrtle Boat Club and Kaiulani Boat Club; Alf Rogers and Kaiulani, with the one with the last name winning. 16—Single sculls race [Heihei waapa pukahi], Novice, Malolo, and Benicia, with the one with the last name winning. 17—Launch race [Heihei lana], Kuliaikanuu and Hanakeoki, with the one with the first name taking the win, although it was contested. It was a breezy day, and the race grounds outside were blustery, but not so inside; a sudden shower sprinkled down but not so much; the citizens were filled with joy that day; some were drunk, and some fought, while some gambled, some were lucky and some were routed. In the evening the cannons again sounded. Ka Nupepa Kuokoa, Buke XXIV, Helu 47, Aoao 3. Novemaba 21, 1885. Episcopal Church in Hawaii, 1861.